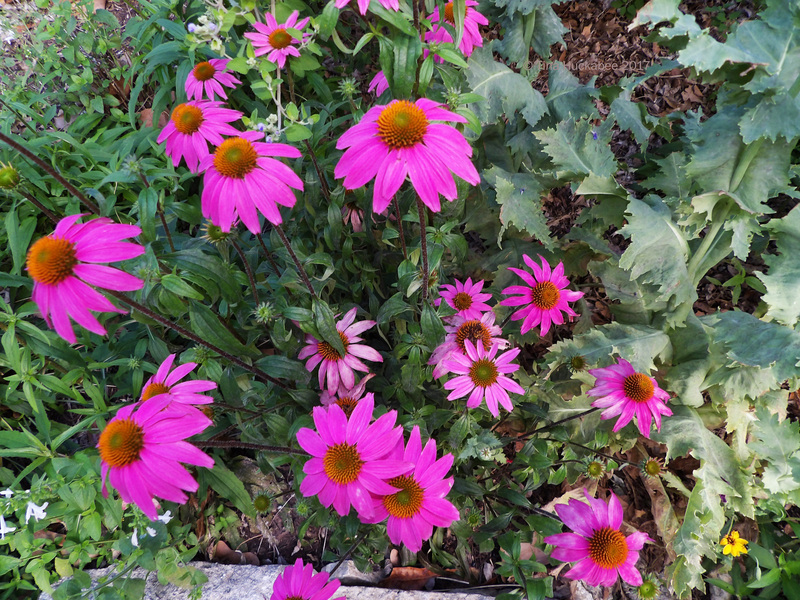 Besides being garden head-turners and absurdly easy perennial growers, Purple coneflowers, Echinacea purpurea, are also some of the best wildlife plants in any home garden. Now, as Central Texas enters its mid-spring-into-summer bloom period, coneflowers are reaching their zenith of beauty and bounty. Everyone visiting wants a meal at Cafe Coneflower. Enjoying a coneflower is a plain little Dun Skipper, Euphyes vestris. According to Austin Bug Collection, a local Austin insect resource, the males of the species show no demonstrable markings, but the females have a few spots on the forewings. Another of the many skippers endemic in this region is the Julia’s Skipper, Nastra julia. …and as dining companions at Cafe Coneflower. 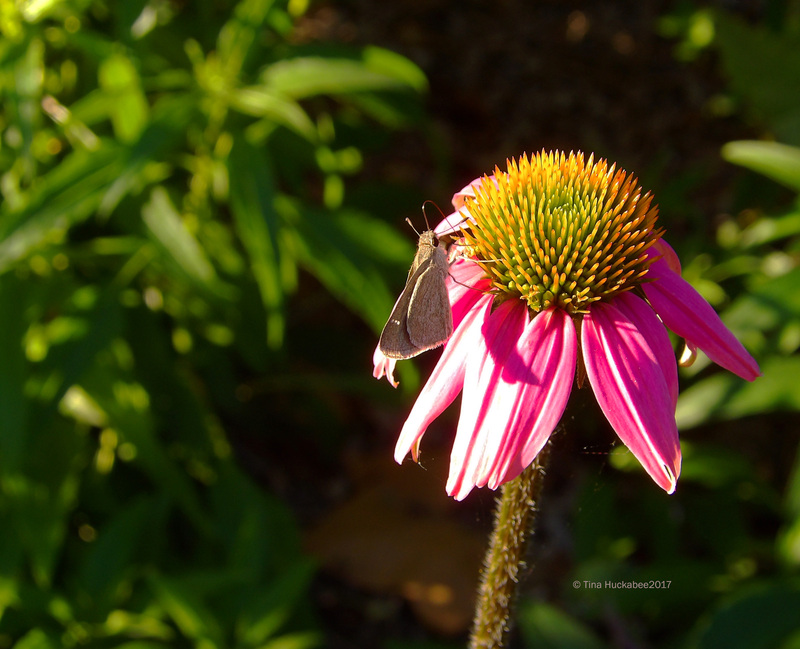 Texan Crescents, Anthanassa texana, are all over the garden, all the time, but they always check out the coneflowers for a good nectar snack. 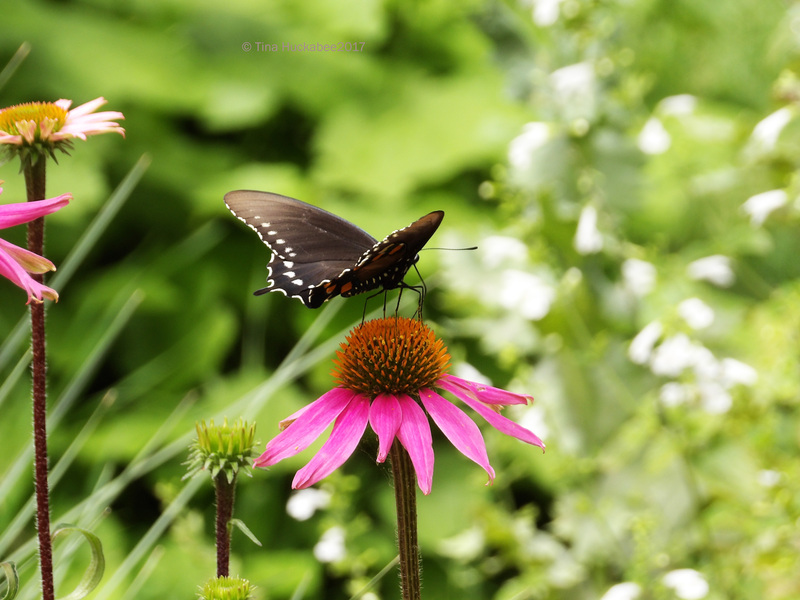 This Black Swallowtail, Papilio polyxenes, heads for Coneflower Cafe whenever he/she is out-and-about, typically during sunshine-drenched afternoons. Of course, honeybees will always be found partaking a good nectar meal. 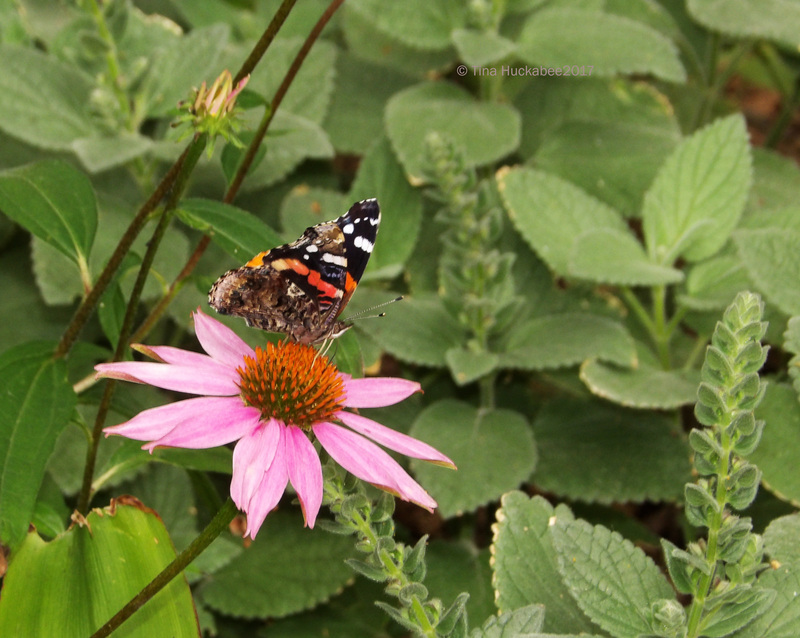 It’s easy to catch a Red Admiral, Vanessa atalanta, dining on flowers in the garden, but right now, it’s all about coneflower cuisine for these friendly pollinators. They move around the flower during nectaring, so it’s easy to glimpse the various sides of their wings. 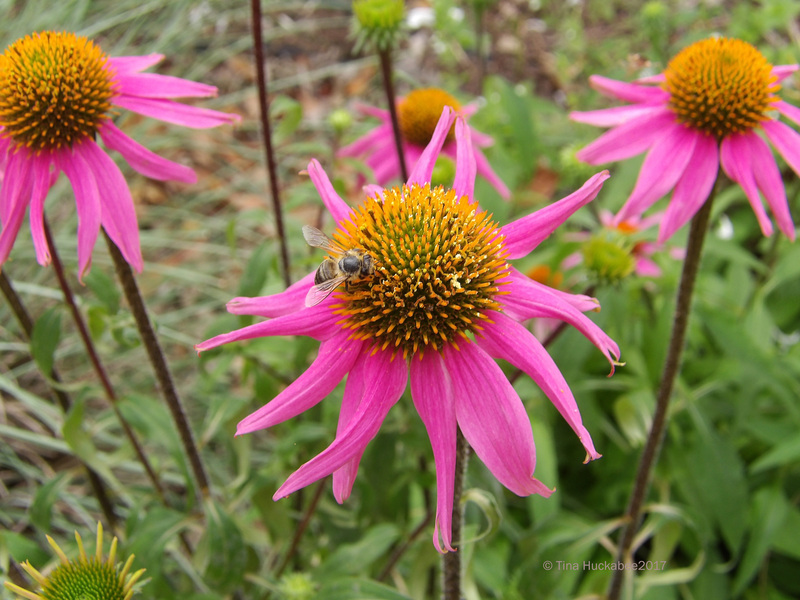 It’s not only the butterflies and honeybees who like coneflowers, though. A Spot-sided Coreid, Hypselonotus punctiventris, worked the coneflower one morning. BugGuide calls this bug a Spot-sided coreid, but Austin Bug Collection says that this common coreid to Central Texas has no common name. I’ll call him handsome and leave it at that. 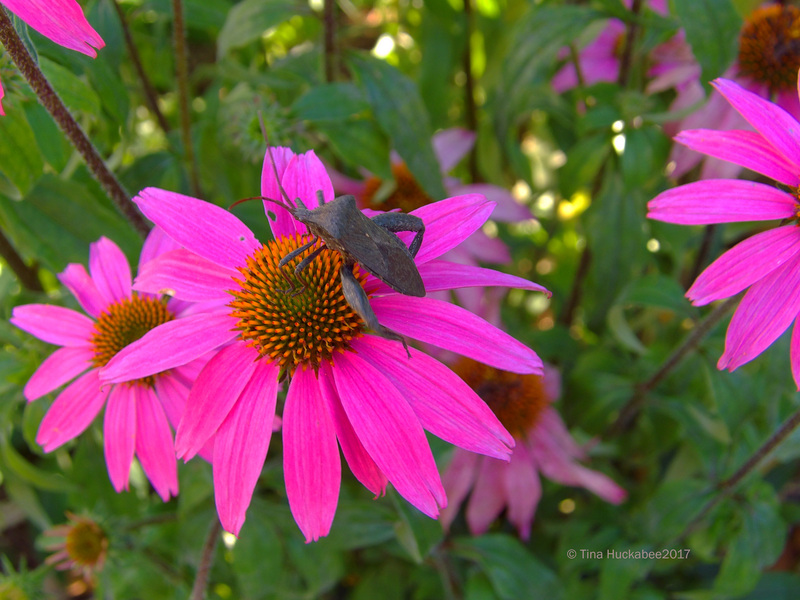 This Leaf-footed bug, Acanthocephala femorata, posed impressively on his coneflower plinth. I think these bugs are charming, though a little intimidating because of their size. 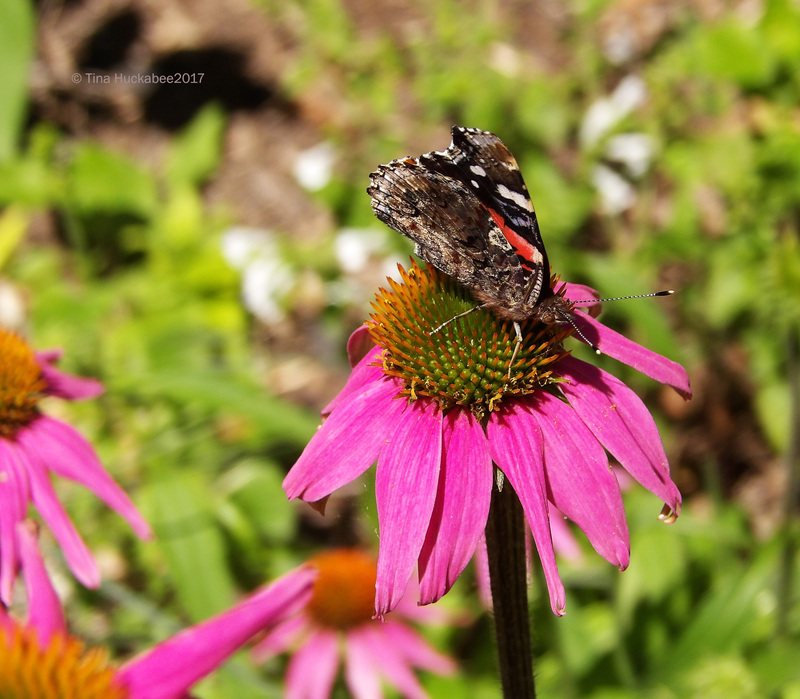 But I can’t question this one’s affinity for the coneflower–it’s something we share in common. As the blooms fade, the birds and some mammals will also reap nutritious rewards through the seeds from this valuable perennial. 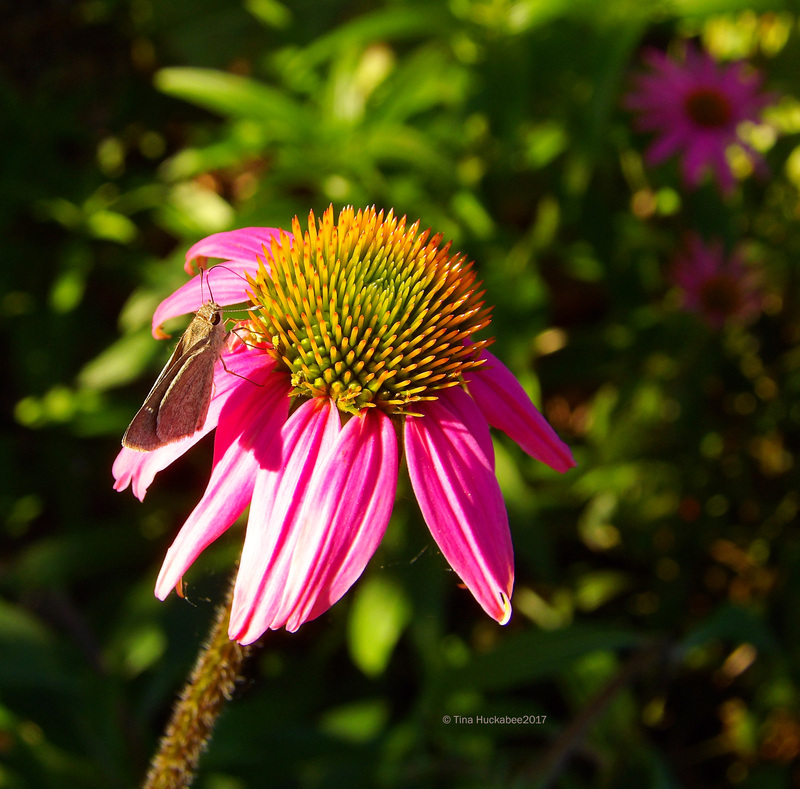 I appreciate the beauty coneflowers bring to the garden, the critters like the bounty. A win-win for all, I’d say. 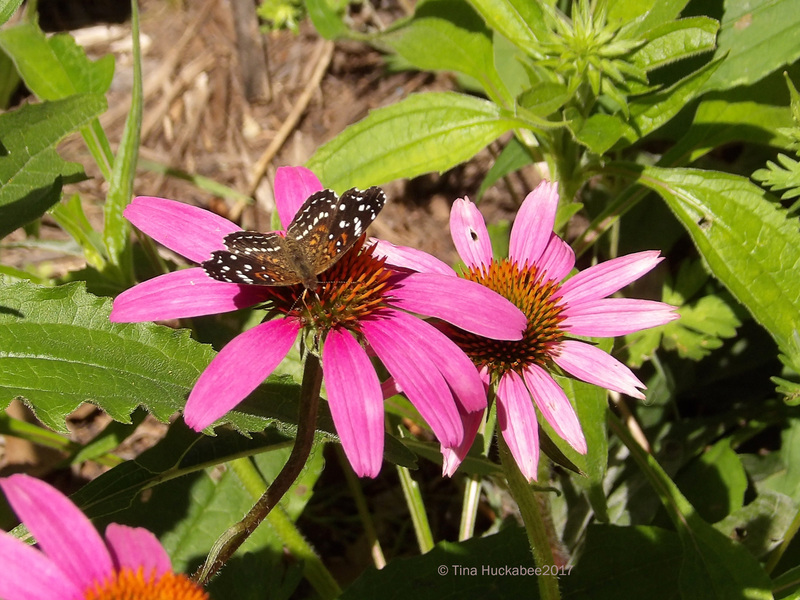 This entry was posted in Echinacea purpurea, Purple coneflower, Uncategorized and tagged Biodiversity, native Texas plants, Pollinator Plants by Tina. Bookmark the permalink. Yours are much earlier than mine. I used to have a lot of them and they disappeared. I’m in the process of trying to get a good crop going. They can poop out sometimes, that’s happened to me as well. Fortunately, they’re easy to start from seeds. Good luck! So pretty…wish I would have planted them this year! Yeah, you really can’t go wrong with them, can you? 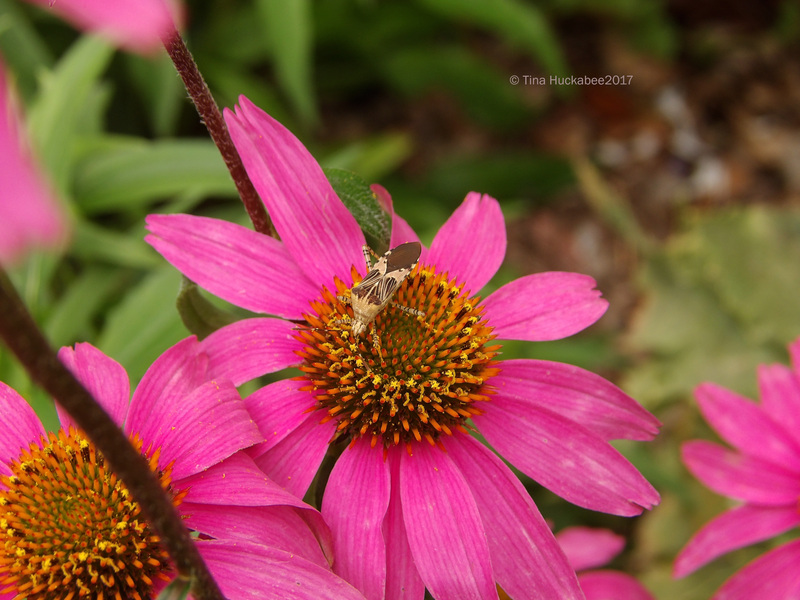 Tina how many different insects feed the precious Echinacea purpurea. Nunaca had stopped to think about it. It’s a wonderful flower! 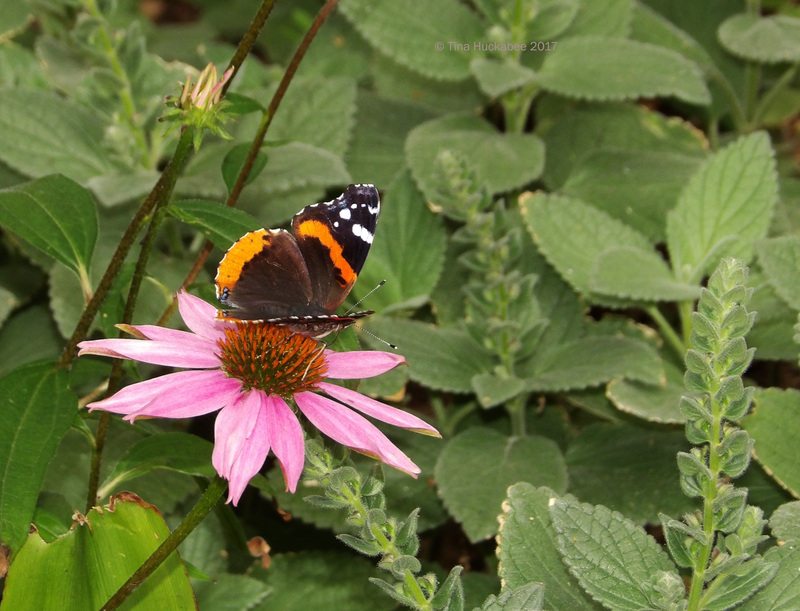 Of all the insects that are very beautiful, I stay with the Texas growing and the Red Admiral: and of course with the bees. All the photos are magnificent. Greetings from Margarita. I’m glad you like the flowers and the insects who visit–so do I! My friend in the hill country’s still waiting for hers, although there was one (!) reported in bloom in Medina. That was two weeks ago, though, so I suspect they’re developing nicely. It’s amazing how many pollinators love them — and how many will gather on one flower head. When I was in Missouri last fall, I found a lingering gaillardia with six butterflies on it, all happily browsing the buffet. Multiple species together always are nice, too — as are your photos of your garden’s bounty! 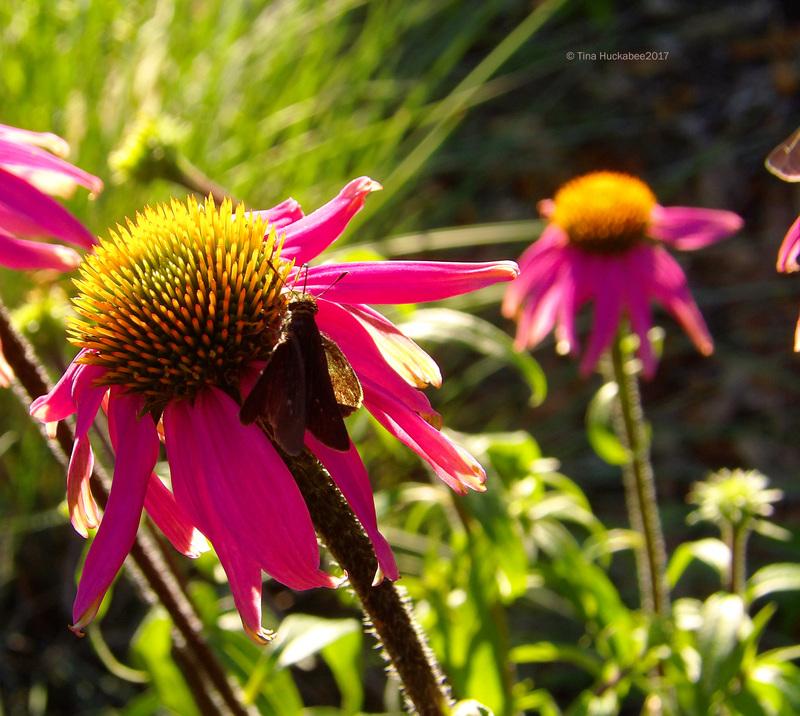 Coneflowers enjoy a long growing season, I think, starting and ending at differing points in time. I couldn’t agree more that multiple species together is so, so nice! I can’t imagine having Echinaceas blooming in April! Mine bloom from late May or early June through the summer. But, yes, when they’re blooming it’s pollinator buffet time! 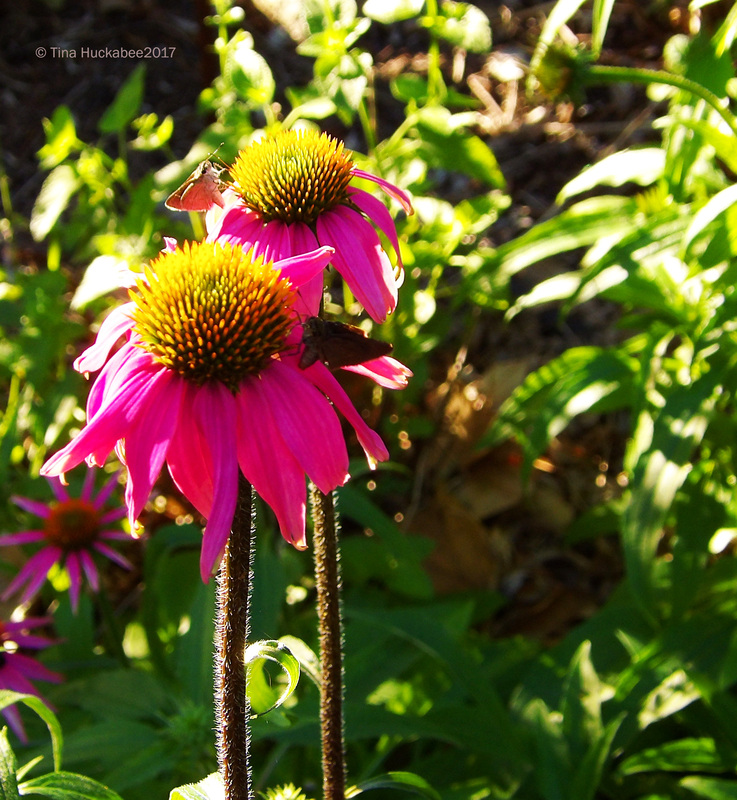 The butterflies really become plentiful in the garden when the coneflowers bloom. Beautiful photos! Ha! Our spring crop will bloom until late May/June, turn a bit crispy (which I rather like and so do the birds). Then, there is a second bloom-up, not as dramatic, in September, October and until the first freeze. They are wonderful and so rewarding all round. Do you grow other colours or are they less attractive to the critters? 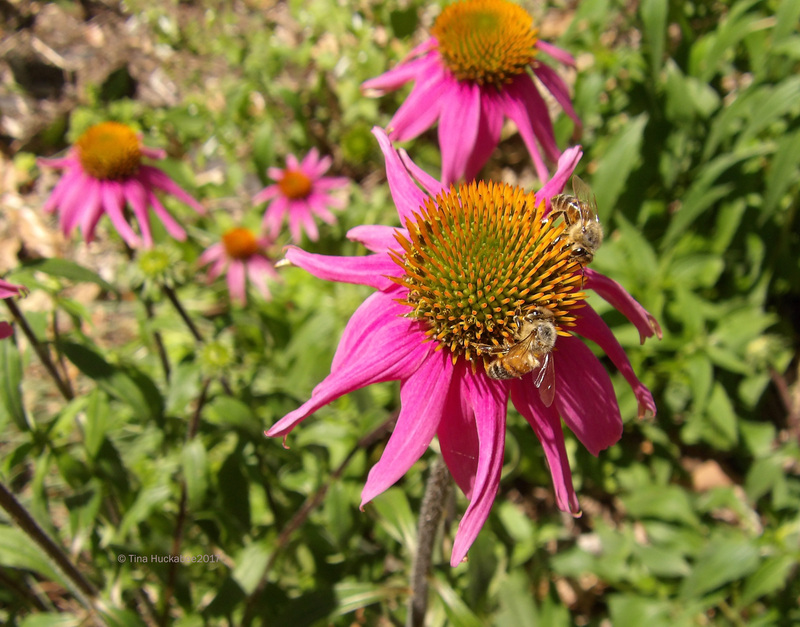 Coneflowers are truly rewarding–for the gardener and the critters. I don’t grow any other colors, except the differing shades that hybridize naturally: all shades of pink and purple. I once bought a white one, but it didn’t do much before it died. That was long ago.